These very pretty attachments are Crochet Flowers and they can look really stunning on your projects. This is very old craft and maybe you have seen your Gran or Great Gran do it and been fascinated as her fingers worked the yarn. I taught myself how to do it many years ago from ... in my teens ... by following the instructions in a magazine. I got hopelessly lost at first but once you understand the stitches it is easy to do. I have made all kinds of things. I used to make hats and scarves for school chums, waistcoats and socks to keep out the cold weather. When my children were small I made them dresses and cardigans, bootees and bonnets. 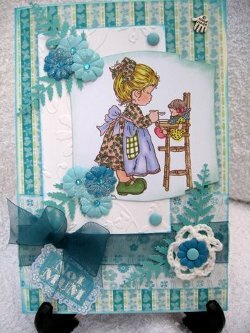 It's a really relaxing craft and the results can be so pretty. 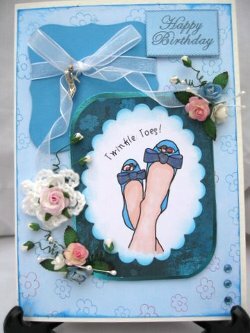 Having got this skill in my fingers I decided to put it to good use on my cards. These flowers take very little yarn and can be made in no time at all. Make a batch as you chat to friends or watch TV. 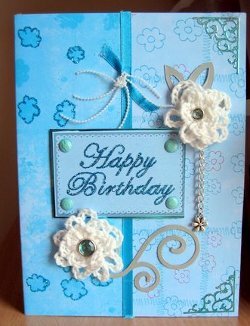 This card has two flowers with a gemstone brad in the centre. It is attached to the card with a small blob of silicone glue. You can make all manner of things too. Crochet some butterflies or hearts and add them to your creations to suit the occasion. Make them in different colours to match your theme, or maybe two colours to ring the changes. There are many books on how to make these flowers in lots of different styles. Stitch some beads onto them to make them sparkle. Or even crochet them completely in a sparkly yarn for added glamour. For your free pattern of the crochet flower that I have featured just click on the link to Woolcrafting.com and print it off. Have a look around Jills' lovely site for more crochet ideas. There are full instructions on learning how to crochet and all the stitches are explained fully. Give it a try for magical effects!